Marble Falls, Texas, resident Karen Marshall admits she was distracted on the morning of May 7, 2013. Karen was on her way out of town, and well aware of the construction on the highway. She had traveled that route many times—before and during the road construction. “Him” was a dump truck that Karen rear-ended. Traffic had slowed to a crawl, but Karen barreled into the truck going 65 miles per hour. She was driving a company car, and when the dust settled, a co-worker who saw the logo on the car opened the door and sat with Karen until the first responders arrived. 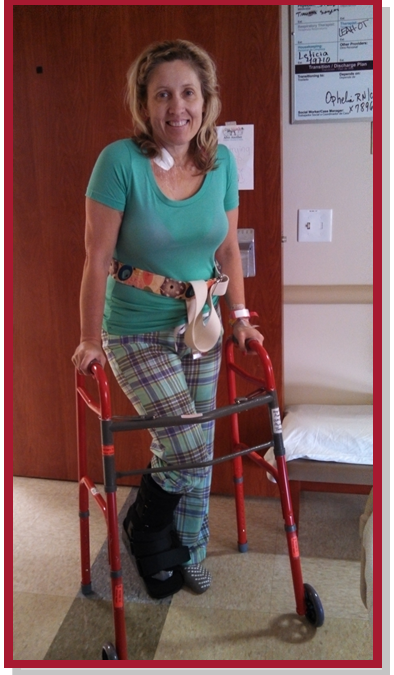 Karen suffered a broken back, ribs and tail bone, a compound fracture of her ankle, and internal injuries. She spent two weeks in the hospital and another week at a rehabilitation hospital. She attends physical therapy three times each week, but can now walk with just the use of a cane. “I’m trying to get better as fast as I can, because I love people and being out and about,” she said. One of the first things she did once she was able to get out of the house was write thank you notes and make goodie baskets for the first responders who helped her, including the Marble Falls, Texas, crew of flight nurse Mary Nunnally, flight paramedic Manny Gallegos and pilot Adam Patterson. Karen works in community and economic development and often travels around the area to give presentations. While she was still in the hospital, her company asked her permission to develop its own presentation for the employees. Karen said these days she is vocal about distracted driving.